Touching the fringe of Jesus’s garment as it is related in the Gospel, reminds us of the ritual prayer shawl or talith worn by pious Jews. For it is with the fringes of these shawls that one dares touch the Torah, the scrolls of God’s word. How significant that believers in the time of Jesus understood in this way and recognized his divine discourse. The fringes hanging from the prayer shawl are furthermore a reminder of God’s commandments. According to rabbinical law, each fringe is composed of eight threads and five knots which – when counted – amount to 613, the number of prescriptions in Mosaic Law described in the books of Numbers and Deuteronomy. 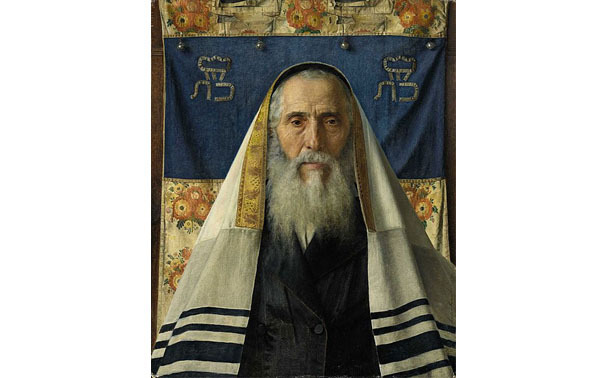 According to the Midrash, the prayer shawl is supposed to cover the head and shoulders of the worshipper in veneration of God’s presence, enveloping the person as a means of protection. In Isaiah 40:31, the talith is also called a “tent” in which one finds oneself “under the shelter of his wings”. The 613 commandments refer to the numerous precepts on the dietary laws and hygienic behavior appropriate to the children of Israel. The knots and fringes worn daily are thus reminders of the intricate requirements of Jewish law, even though we know the Lord’s complaint from the prophet Isaiah: “This people honors me with their lips but their heart is far from me” (Isaiah 29:13). The Pharisees obeyed scrupulously the rabbinical interpretations of the Law, claiming to attain their justification before God thanks to the necessary purity it imparts. But we read that Jesus reproached them for “binding heavy burdens hard to bear, laying them on men’s shoulders”. The practice of the Law tends to make one forget its purpose. “You leave the commandments of God and hold fast the traditions of men” (Mk 7:8) and “there is nothing that enters a man which can defile him (…); from within the heart of man come evil thoughts and actions” (Mk 7:21,22). Mary, Untier of knots, please pray for us!